Discoveries are found all throughout Arcadia. Some are easy to find; others are hard. When you get near a Discovery, your Compass will go wild. Some Discoveries require you to adjust your altitude a bit to find them. After you find a Discovery, go to the nearest Sailor's Guild and sell it. The sooner you sell it, the more money you get. You can buy tips on where to find some of the Discoveries, but if you're too slow in finding them, Domingo will find it first. You can still sell that Discovery to the Sailor's Guild, but for very little money. I'm providing a description where to find each Discovery along with three maps. As a note, my coordinates designate a square on the map by counting from the left to right and upwards from the bottom of the map. If two coordinates are given, that's because the Discovery is right on the line between two map squares. Once you get 30 Discoveries, go to Gordo's Bistro to get Domingo to join your Party. After getting him, report to him in your Meeting Room once you get 40 Discoveries, 50 Discoveries, and 64 Discoveries. Each time you'll get a new item. I've listed the Discoveries into Mid-Altitude, Below the Clouds, and Above the Clouds. The order of the three tables is based upon the number of the very first Discovery in each altitude range. Pirate's Grave 5,5 1 It's basically right in front of you when you first gain control of the Albatross. It's on the first small island South of where you start. Guidestones 8,7 2 They're on the island Northeast of Sailors' Island. Sky Coral 7,4 or 7,5 3 It's above one of the smaller islands in this area. You need the Harpoon Cannon to get to it. Silver Moon Pit 4 7,5 It's on the island North of the Sky Coral. Topple Rock 9,6 5 It's on a rock South of Maramba. Wandering Lake 10,6 6 It's easy to see and moves around very little. Oasis 10,6 or 10,5 7 It's in the middle of the desert South of the Wandering Lake. Sandfalls 10,5 8 Just get near the floating island. Temple of Prynn 11,7 9 You may need to fly around it a bit to set you Compass off. Beak Rock 5,3 10 Find the Sky Anenome first. Beak Rock is on an island near the Dark Rift pointing Northwest. Sky Anenome 7,3 11 It's on a southern island near the Dark Rift. Ixa'taka N/A 12 You find it when you get close enough to Ixa'taka. Garpa Fruits 3,5 13 It's under the island Horteka is on. The Great Bird 2,6 14 Fly around this area with the camera giving you a overhead shot. The Great Bird is visible, so it should be easy to find. Golden Man 3,6 15 Search the plateau next to the King's Hideout. Gates of Rixis 2,7 16 Line yourself up with The Great Bird and go in a straight line. You may need to go to Moonstone Mountain first. Ixa'takan Palace 3,6 17 Head South from the Golden Man and search between the three rocks. Ixa'ness Village 2,4 18 It's in a clearing on the island North of Moonstone Mountain. Mysterious Rings 3,8 19 Find Will o' Wisps first then briefly head South. You've gone too far if you encounter the Air Pirate ship. Will o' Wisps 3,8 20 It's on an island North of the Iron Gate. Roc's Nest 2,8 21 It's on the grassy part of an island West of the Iron Gate. The Giant Throne 5,8 22 It's on the Eastern side of one of the islands in North Ocean farthest east. Lighthouse Ruins 6,10 23 It's on the West tip of an island near Valua. Ancient Palace 8,9 24 It's on the towards the right near the mountains after you enter Valua. Skull Rock 10,10 25 After finding Daccat's Island, head west. It's near a crevasse between two islands. Stone City 8,10 26 It's along the side of the Valuan Continent. Ship Graveyard 9,7 or 9,8 27 It's in the North Dannel Strait. Philosophy Stone 8,11 28 It's on a lone island. Balloon Flower 10,11 29 It's North of Skull Rock. Lands of Ice N/A 30 You get it when you get close enough to the Lands of Ice. Icebird 4,1 or 5,1 31 Best I can say is to mash the A button repeatedly while between these two coordinates. It's in between a lone mountain and a mountain range. The Frozen Giant 5,1 or 6,1 32 It's on the North side of a non moving glacier. Aurora 5,12 33 You can see this almost everywhere in the Lands of Ice. I usually get credit at those coordinates. Blimp Wreck 10,2 34 It's on a small island just West of the Dark Rift entrance. Giant Squid Nest 11,1 35 It's above a crater on the big island. 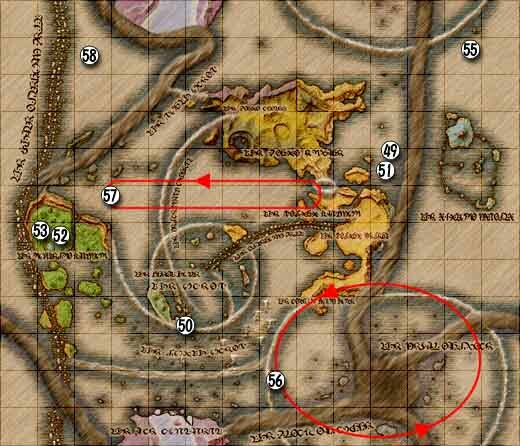 To get to this area, you need to fly North from Crescent Isle and go through a Sky Rift. Black Moon Stone 11,2 36 It's in the freaky room, well all the rooms are freaky, but it's in the center of the freaky room with the Moon Stones floating around in the Dark Rift. Yafutoma N/A 37 You get it when you get close enough to Yafutoma. Uguisu's Nest 12,4 38 It's on the first normal island after leaving the Dark Rift but without crossing through the Sky Rift. Guardian Walls 13,5 39 They're the giant walls. You can't miss them. Wanderbirds 13,9 40 They're just North of Mount Kazai. You don't always see them, so just sit there and wait for them. They're one of the most aggravating Discoveries in my opinion. Dheerse 14,8 41 It's on the big island East of the city. Grieving Prince 2,4 42 It's on an island in between the Dark Rift and the White Stone Reef. Spice Island 12,6 43 Just head North from Uguisu's Nest. You get Khale from here. 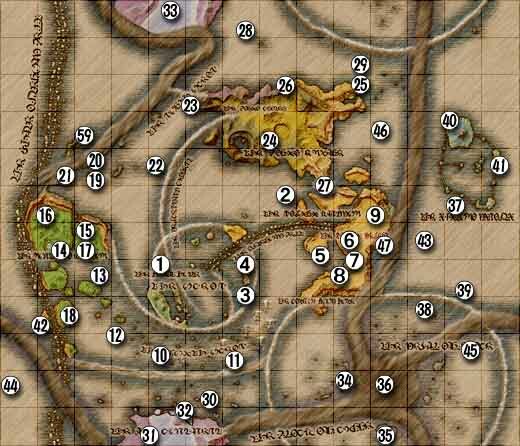 Mystic Orchard 1,2 44 Find where the Dark Rift and the White Stone Reef intersect and head West. To get to this area, you need to head North from Yafutoma, and once you reach the bottom of the map, head East. Inverse Isle 13,3 45 Just head North from Ryu-Kan's Island for 12 to 15 seconds. World is Round N/A 46 You get it when you return to Crescent Isle on Disk 2. Ruins of Rolana 11,6 47 Just follow the Dark Rift East of Nasr and head South until you reach a grassy patch. You can (and I suggest you do) find this while your party is split up or at least before you head to Esparanza. You can sell it for a good amount then. Looper's Nest 3,9 59 It's at the Northeast of the island where the gray parts meet the green parts. If you can't find it at first, it doesn't matter. You only have to deal with random Looper encounter. Southern Cross 4,2 48 It's really big. You can't miss it. Dancing Lights 9,9 54 They're very easy to see. They are there to show where the cracks in Valua are. Flying Machine 6,5 60 It's very easy to see and needs no directions. Valuan Wreckage 8,7 or 8,8 61 It's on the only island down there. Rabbats 9,9 62 Just head straight North from the Dancing Lights while tapping A.
Bottomless Pit 4,6 63 Head Southwest from Dangral Island. Ancient Fish 10,1 64 Go beneath the island where you found the Giant Squid Nest then head West. When you see a lone fish swimming near the clouds, you've found him. After you find the Ancient Fish, you can catch and sell him like any other fish, but this one is worth 3000 gold. Rainbow Island 11,8 or 11,9 49 It's at the end of the Rainbow very high up. Moon Stone Lake 5,4 or 6,4 50 Just follow the Moon Stone Waterfall to its source. Iron Star 11,8 51 It's the red flashy thingy above the Nasr region. It's close to the Rainbow Island - a little bit South to be exact. Alupas 2,6 52 It's next to one of the twin waterfalls in this area. Observatory 2,6 53 Head South from where you procured the Green Moon Crystal. It's on the first plateau you see. The Mother Tree 13,11 55 Head South for a few seconds from Tenkou Island. The Ghost ship A lot of them 56 It flies in a counter clockwise circle above the Dark Rift, Esparanza, The Giant Squid Nest, and the area near Ryu-Kan's Forge. It's actually pretty easy to see. Just fly clockwise in its path. Flutterflies 3,7 or 3,8 through 9,7 or 9,8 57 This is one of the most annoying Discoveries. You just need to park the Delphinus in their path and wait for the barely visible Flutterflies to arive. They travel in a counter clockwise path. There's a boat above the Clouds in the Ixa'taka region that gives a clue on where to find them. Eclipse Point 3,11 58 You need to be sort of close to the Clouds to find it. Fly around until the screen turns dark then press A.